- 13:00 - Free Hog Roast! - New to AWE, Definitive Technology SuperCube 8000 active subwoofer – 1500w of class HD power! + Demos, presentations, and lots more to be announced! “We are repeatedly told that our AWE Expo is the best of any in the UK, and this Expo will be no different. It’s hard to express just how much has changed even since the expansion of the new areas just 12 months ago! With the very latest innovations and market-leading products on show, we’re looking forward to welcoming attendees this October” comments Stuart Tickle, AWE Managing Director. Manufacturer representatives for these leading brands will be present at the event and ready to explain the key features and benefits to visitors. 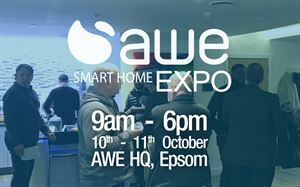 Alongside the show apartment demos, AWE will be running in-depth product seminar sessions to allow attendees to dive further into the technical details of some of the key products.